Did you hear?! It's time for a Midsummer Mini Mayday Craft + Art Show! Yippee! The creators of the now famous Mayday Underground Craft + Art shows here in Rochester decided November was waaaay too long to wait to bring you more indie crafty goodness. Say "Yay for Midsummer Mini Mayday!" If you are one of the 20 first shoppers through the door you get a FREE swag bag filled with goodies from the fantastic vendors! There is swag from me at In My Head Studios! 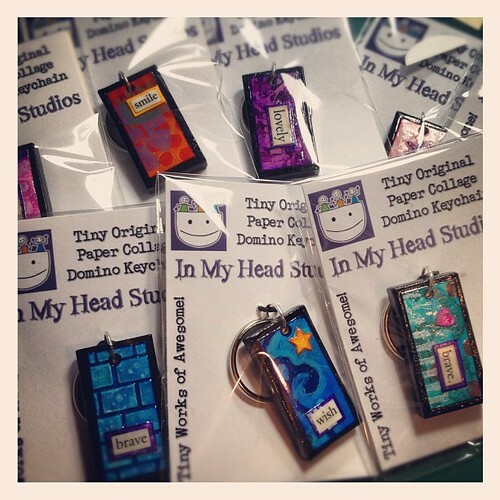 I made handmade, tiny, original paper collage domino keychains! How cute are these?! They are truly one-of-a-kind and Tiny Works of Awesome! I made them with my own handmade stamps, handpainted paper, and words from books. Right now only 20 of these exist so snagging some swag from me will be special! Midsummer Mini Mayday!Saturday, July 28, 201210 AM - 4 PMThe Decibel Lounge45 Euclid StreetRochester, NY 14604Plenty of free parking!! Just over 20 of the most creative, indie artists and designers in Rochester will be there! I'm excited to see my crafty pals! I better see YOU there, too!